Like women artists, African American artists have been neglected in the major art history survey texts, especially when it comes to pre-emancipation. I am always delighted to have an epiphany about an artist I never knew much about. Although I must admit, it is extremely difficult to find biographical information about many black and women artists before the end of the 1800s. 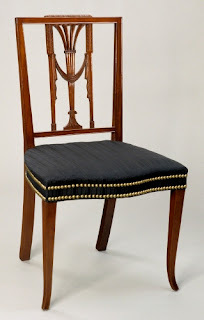 In the relative “boom” economy after the American Revolution (1775–1783), there was a great demand for the miscellaneous arts, particularly furniture, ceramics, metalwork, and glassware. Many African Americans in the North, and some in the South, were apprenticed to trained artists based on their skills from their African roots. Philadelphia’s Germantown neighborhood was home to a sizeable population of free African Americans who provided a thriving artistic service for growing Philadelphia. Thomas Gross, Jr. was apparently a free black person. He had a prosperous business as a cabinetmaker (furniture maker). As was typical at the time, he also worked as an undertaker because his woodworking skills made him a handy coffin-builder. This chest-on-chest, which mimics the then-fashionable highboy, was a practical storage piece of furniture in a period when closets were not widespread. 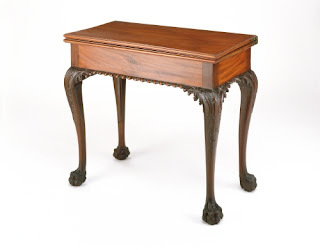 It reflects the popular neoclassical style of the Federal period (ca. 1783–1830) with its geometric simplicity and pediment top. 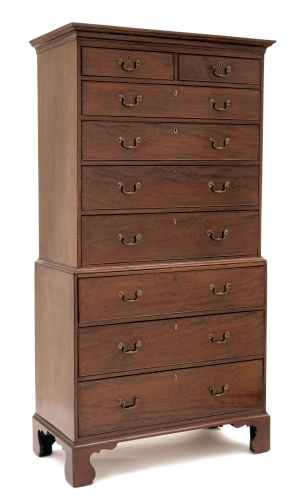 The chest-on-chest was made in America after the 1750s. Although many of these chests were designed in the Chippendale style, simpler versions like this one form the majority. Unlike the highboy that rested on cabriole legs, the chest-on-chest almost uniformly is supported on bracket feet. 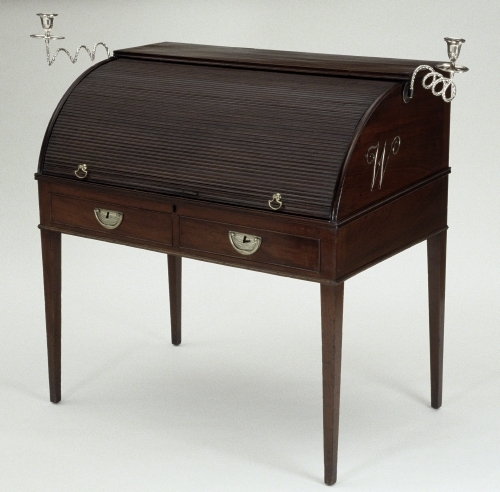 The chest-on-chest form was originally introduced in Britain around 1700. Studio activity: Design a chest that expresses personality. Take a cardboard box and combine it with cut out shapes in paper to create a unique cabinet. Color it with markers or watercolor, and indicate drawers with a black thin-point marker. Express your personality by extending the basic geometric shape to include curled, folded, and bent shapes on the attached paper.